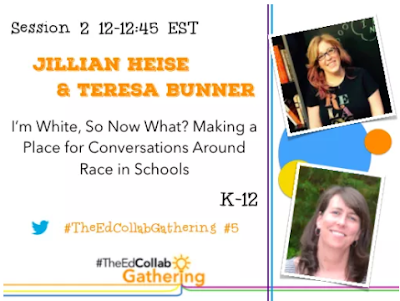 Heise Reads & Recommends: My #TheEdCollabGathering Session: I'm White, So Now What? My #TheEdCollabGathering Session: I'm White, So Now What? I was honored to again participate in The Ed Collab Gathering this weekend. If you aren't already aware of it, it's one of the best, FREE, PD opportunities out there. Free, streamed online into the comfort of your own couch, and quality sessions that you'll want to listen in on. And, the better part (if anything can be better than PD in your PJs!)? You aren't left with FOMO from your session choices because all the sessions are streamed live via Google Hangout, and then are available immediately afterwards as video playback! I presented a session with my friend Teresa Bunner, one of my edu-mentors, around race and equity and our responsibilities to our students as white educators. Here's the link if you'd like to listen in and do some thinking around your journey related to bias, privilege, and equity: I'm White, So Now What? Making a Place for Conversations Around Race in Schools. We no longer have the luxury to not bring these conversations into our classrooms, and that work starts with us as teachers. Videos from this Fall Gathering will be up until the Spring Gathering in April. So take some time to look at the session topics, and see if there are any that appeal to your needs for support or growth. It's well-worth 45 minutes.